The Polarpak MOFLOW (more flow) reservoir has completely changed the way to consume liquids from a reservoir. The MOFLOW systems are pressurized with a detachable pump and are extremely easy to use. It takes less than 30 seconds to completely pressurize your reservoir. "The system works extremely well and offers benefits to a multitude of activities," states Jeff Skillern, President and Founder. The Polarpak MOFLOW reservoir studies have shown that you consume up to 30% more water while using it. Not only is it pressurized but the entire system is 100% antimicrobial. Microban® is built in during the manufacturing process and inhibits the growth of microbes, such as bacteria, mold and mildew that can cause stains, odors and deterioration of the product. Microban is added to all components of the Polarpak MOFLOW including the fill port, cap, hose, bite valve and film. Skillern states: "We are very fortunate to have an agreement with Microban. Their brand is your assurance of continuous, durable and effective antimicrobial protection that will provide an added level of defense against damaging microbes for the useful lifetime of this product." 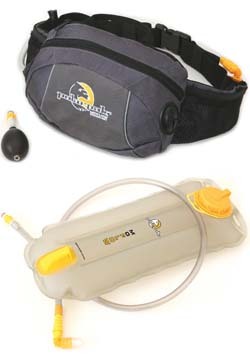 For 2007 the Polarpak MOFLOW will be offered as a replacement 70oz reservoir and there will also be a MOFLOW waist pack for runners and hikers in May. "We are starting out slow this year to truly educate the consumers and build solid relationships with our dealers. The evolution of this technology is very exciting, so stay tuned," says Skillern. Polarpak is a privately held company which designs, manufactures, and markets cutting edge outdoor equipment, hydration systems, backpacks, and pressurized Hydration reservoirs and running waist packs. All technologies are patented and patent pending. For more information call 208-426-9058 or visit www.polarpak.com.